Eric Clapton was born on March 30, 1945 in Surrey, England. His dad was 25 but his mom was only 16 at his birth. Before Eric’s arrival into the world, his dad was shipped off to war just and returned to Canada after his release. Because of this unique situation, Clapton believed his grandparents were actually his parents and that his mom was an older sister. Years later, his mom married another Canadian solder and moved to Germany, leaving Eric behind. At age 13, Clapton got his first guitar, a clunky, inexpensive Hoyer. Struggling with the instrument, he put it down for a bit, but came back to it after being reinvigorated by listening to more and more blues music. 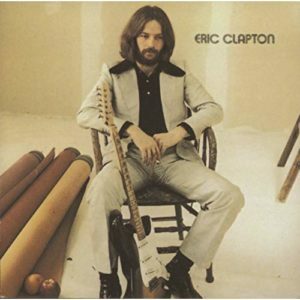 By age 16 Clapton’s guitar work was so advanced, he began getting noticed in the industry. By the time he became an adult, he had played in three or four bands, mostly with much older members. Because of his guitar mastery, Clapton would go on to star in major acts like The Yardbirds, Cream and Derek and The Dominoes. Today however, we’re focusing on his solo career that essentially began in 1970. His Self-Titled debut album was released in August of that year. Starting almost as a side project at first, recording took place in late 1969 and picked up again early in 1970—the latter was split into a Los Angeles and a London recording session. Clapton recalled loving the atmosphere of recording and being really happy with the end result—only lamenting his vocal sounded so young and high-pitched. Even at a young age, Clapton wanted to sound like “an old guy.” The album was praised for its laid-back nature, and how warm and friendly it sounded. Sales of the album weren’t amazing and it only got up to #13 on the Billboard charts. But most could tell the arrow was pointing in the right direction, and it was just a matter of time before his solo work sky-rocketed him to even more fame and fortune. As noted in the lead, Eric Clapton is a legend. It’s amazing to go back and listen to all of his music over the different eras, and one thing is consistent, it’s all amazing. If you add up all the different bands and collaborations, he’s sold over 100 million albums in his tenure. His signature is taking the blues as the mainstay, but adding elements of folk, R&B, country, bluegrass and whatever else he feels like to it. That trait is seen no matter what he does. Like many artists of the time, Clapton struggled heavily with substance abuse. His career was also marked with tragedy. Clapton was touring with Stevie Ray Vaughan when he was killed in a helicopter crash. Clapton’s son was also killed after falling from the 53rd floor window of a New York City apartment. All of those things could have prevented Clapton from leaving the mark he did on so many fans and other artists, but somehow he kept on. Just another mark in the legacy of a legend. At age 73 he’s still getting it done, with a Christmas album set to release in a couple weeks. I’ve had the fortune to see him live a couple times, and he puts on quite a solid show. Seeing him riff on the guitar is quite a sight to behold. If you’re a Clapton fan, go back to the original solo work today. At only $5.99, you’re hardly a bad boy for picking it up. In fact, I don’t know why you wouldn’t grab this today; wash away your Tuesday blues.